How do you know when a politician is lying? His lips are moving." --Political joke. Politicians don't lie. They misspeak, they overstate, they understate. And the press distorts, takes out of context, twists, exaggerates or does something equally heinous to what they've said. Poor dears. What is a political lie? Smart politicians avoid political lies by resorting to politician-speak--the language of un-communication. For example, any sentence that starts with "let me be clear" or "I've been perfectly clear about this" will be followed by a load of obfuscation. (Watch for this with Mr Prentice. He's been perfectly clear about many things). Politicians who do lie generally resort to exaggerations, lies of omission or contextual lies. Whether we get bent out of shape by political lies depends on who got gored and how badly. If the lie helps our side and hurts the other guys we're inclined to lay low and move on. If not, we make an ungodly fuss. 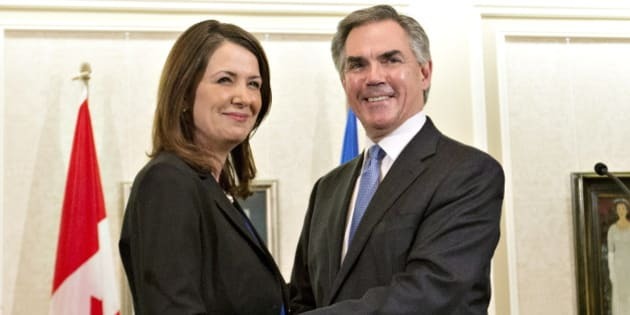 Danielle Smith, the ex-Leader of the Wild Rose and Her Majesty's Official Opposition, said she joined Mr Prentice's Progressive Conservative government because she discovered there wasn't much difference between his policies, resolve and shared interests and her own. She said Mr Prentice was sincere and had a firm grasp on what needed to be done. She thought he'd "been very honest about the challenges we face." A month earlier she said the exact opposite: "The Premier likes to claim that the province is under new management, but the throne speech makes it clear that the new management has no strategic or operational plans. If this were a business, the market would be expressing deep concerns about how the new management has such a poor grasp of the fundamentals." The ruse of politician-speak, let alone exaggeration, omission or the contextual lie were unavailable to Ms Smith given that she joined the man and the party she'd reviled just the month before. Her praise of Mr Prentice rings hollow and she will go down in history as a lying politician who sacrificed her party on the altar of her own ambition. Lies or a lack of integrity? In the last two months, Mr Prentice made a political statement and an economic statement that cry out for the Truth-O-Meter. Defection and democracy: Mr Prentice was asked whether accepting the leader of the opposition and 8 of her MLAs was harmful to democracy. He poo pooed the suggestion: "It's not a democratic principle that conservatives should fight conservatives for the entertainment of socialists." Socialists??? If gutting the Opposition isn't a violation of Mr Prentice's democratic principles, what is? Mr Prentice says "to engage in public service is to be a servant of the people of Alberta...We are assumed to be honourable, assumed to be committed to upholding the trust our constituents have placed in us. Serious harm can be done to our democratic institutions when that trust is seen to be violated. Apparently crippling the most effective opposition Alberta has had in decades by allowing nine Wildrose MLAs to violate the trust their constituents placed in them does not constitute a serious harm to our democratic institutions. In fact Mr Prentice justifies his actions as reunification of the conservative party. Others see it as a lack of integrity. Either way, it's a lie. The drop in the price of oil: Mr Prentice became the 16th premier of the province just as oil prices took a nose dive. Prices are now almost 50% lower than when he campaigned for the leadership of the party. The result? A $6.2 billion hole in the budget. Mr Prentice says these are "untested" circumstances. He says this economic bust is unprecedented because this dip is more "precipitous" and is creating "more uncertainty" than the previous oil price drops. In 2008 oil prices dropped almost 70%. Bitumen prices approached $20 a barrel and we were in the grip of a global financial meltdown. So either Mr Prentice has historic amnesia or he's scare mongering to prepare Albertans for a slash and burn cost cutting budget that will make Klein's cuts look like a walk in the park. If it's the former, Mr Prentice is not fit to guide this province through the latest iteration of the classic boom/bust cycle. If it's the latter, Mr Prentice is lying. All politicians lie, or at least change their minds. Sometimes we forgive them (compromises must be made in order to move agendas forward) and sometimes we don't. Research shows that voters will reject politicians who lie to them if there's clear evidence they lied and the lie is important. The backlash against the Wildrose defectors demonstrates that the political analysts are right--the defecting MLAs appear to be heading for the scrap heap come the next election. One can only hope that enough voters see Mr Prentice's lips moving when he says that gutting the Opposition supports the democratic institutions of government and that the 2014 oil slump is something Alberta has never seen before and decide he's following in the footsteps of Richard Nixon's press secretary Ron Zeigler and is misspeaking himself.